The district court of the Swedish city of Kalmar took a decision on Wednesday after the hearings to release from the custody of the navigator from Russia, who was detained in September this year on suspicion of “running the ship in a state of strong intoxication.” The final verdict in this case, on which the captain of the ship was also arrested, will be announced on November 15. Tass was informed about this in the court department. “The court overturned the decision to detain the navigator, he was released. But the captain remains in custody. The verdict will be announced on Wednesday, November 15, “- said the representative of the court Magnus Isaksson. On September 23, an 80-meter Atlantic cargo vessel with diesel fuel ran aground south of Oskarshamn on the eastern coast of Sweden. The captain and the navigator were detained. Bulker under the flag of the Faroe Islands was coming from Visby, from the island of Gotland, in its fuel tanks were 44 thousand liters of diesel fuel. On September 26, at the request of the prosecutor’s office, the court seized the captain and navigator from the Russian Federation on suspicion of “driving the ship in a state of strong intoxication” and “in gross negligence during navigation”. As stated by the prosecutor at the court session, “the autopilot managed the ship for a long time”. The 37-year-old captain does not admit his guilt, he said he took alcohol after the incident. The alcohol content in his blood was 0.88 ppm. A 50-year-old navigator had 1.94 ppm of alcohol in his blood. It was he, according to the ship’s log, who was leading the ship at the time it ran aground. 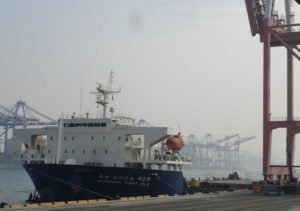 As the record of radio traffic, presented by the prosecution at the court session, showed, after the incident, the Coast Guard rescue service could not contact the vessel for a long time. The public prosecutor demands to deprive the captain of freedom for a period of six months, the navigator – for three months.